We all know what we’re supposed to say when we lose…. “I played my hardest and that’s all I can do”, “It doesn’t matter whether you win or lose, it’s how you play the game”, “If I had to lose, I’m glad it was a loss to (insert biggest competitor/nemesis here )”. All of that is fine and dandy if you want to settle for being a loser and feel better about it. And it seems to be the movement in today’s society; acceptance of defeat whether it’s about sports, weight, school, pretty much anything that challenges us. I’m not saying you can always change the outcome. There’s a lot to be said for grace in a loss… Such as the recent World Cup Final against Japan. There is nothing that can be done now to change how that game ended. The only thing those girls can do is keep working as hard as they can, keep perfecting their game and get better for the future. That’s it. But how about when an outcome can, in fact, be changed? Everyone knows the movie ‘Rudy’, right? He didn’t settle for being told “No, you’re just not that good” and “You’re just too small”. He was the kid that all the cards were stacked against. He was dyslexic, small, slow and from a family of 14 kids. He was never going to naturally just kill the game of football. But, he was not going to take defeat either. 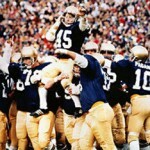 Daniel “Rudy” Ruettiger was rejected 3 times before he got accepted into Notre Dame. He wasn’t even really a walk on to the football team. He was on the practice squad. His job was simply to be an opposing jersey for the varsity team’s practices. But I think he was a sore loser. It made him mad and pushed him harder to hear things like, “You can’t do it”, “You’ll never be good enough”, “You’re not smart enough”…. They drove him to be the best he possibly could. He didn’t settle for showing up in a practice jersey and going through the motions, jumping around a little and waving his arms and jogging from place to place. I believe he sprinted out onto the field, he gritted his teeth, took things into his own hands and wore the varsity players out! He made them be the best they could be by doing absolutely everything within his power to make them play harder and think about their game. My challenge is this, be a sore loser. I don’t mean go around trashing your competitors or acting out any sorts of sabotage and revenge. Get angry. Let coming in second, third and fourth place consume you. Use it to re-evaluate your game, your strategies, your practices and expose your weaknesses. Then attack it. Apple got tired of being second to PC’s. They got angry about it. So, they launched what is arguably one of the most successful campaigns in marketing history and are still climbing. Who doesn’t at least have an iPod these days? You’d have to have been living under a rock somewhere to have missed the Justin Long commercials, right? They decided to change up what they were doing and push to be recognized. If you’re tired of not being the best at what you do; it’s time to change your strategy. The race is on to come out on top in organic search rankings and the game has changed. If you’re not consistently asking questions about how to be better and learning from the pros about the best methods for optimal rankings; then you’re falling behind. Because if you’re not winning, you’re losing. Are you a sore loser?